In modern times, it is home to University buildings and relatively upmarket watering holes like The Royal London and Hogshead, but allow me to take you on a journey into the dark side of the area we know today as Princes Square. Princes Square, full of atmosphere in the autumn of 1969. Although this photo of Princess Street running through Princes Square into Stafford Street was taken nearly 50 years ago, its instantly recognisable today. 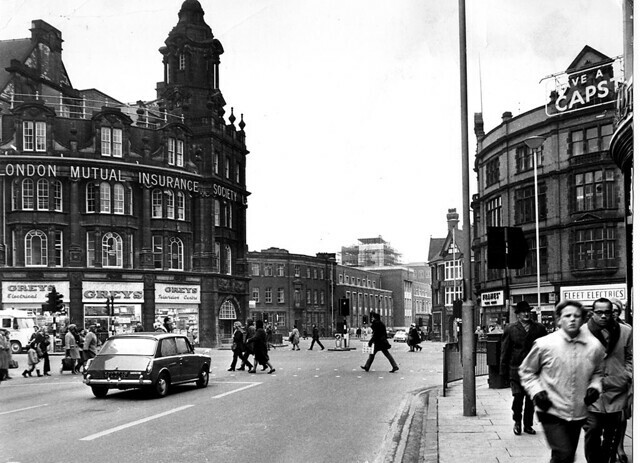 The Royal London Buildings on the corner of Lichfield Street and round into Wulfruna Street dominate this everyday quiet scene in 1969. But if you were to turn back the clock to the mid 19th century, this same area around Lichfield Street was termed a “Den of Iniquity” and was lined with pubs, lodging houses, and brothels. The population was booming, going from 12,500 in 1801 to 60,860 in 1861. Many people though, lived in crowded accommodation around St Peter’s, two-thirds of which had no sewerage and drains. There was, however, at least 126 inns and 83 beer shops, with roughly one pub to every 120 Wulfrunians. 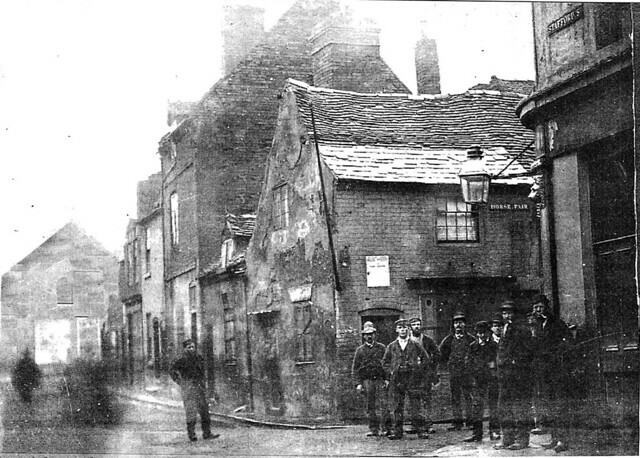 A crowd of men lounge a few yards from the rear entrance of the Brown Bear in Little Berry Street. In front of them, on the corner of Stafford Street and Horse Fair stands the Black Horse. The last 200 yards of Princes Square was known as Little Berry Street at that time and where the Royal London Buildings now stand was a hive of activity. All sorts and conditions of men would reside there; boatmen, labourers, and would-be prizefighters always ready for a scrap. Public houses were thick around this spot and included the Brown Bear and Cooper’s Arms. One resident of a hostel-come-brothel that lived in the area was Catherine Morris, who had fallen on hard times and had turned to prostitution, as well as struggling with a serious drink problem. Her young child had died in a fire when she was drunk and incapable of doing anything. In those days many children through accident or disease. By all accounts, Catherine lived in a single room in lodgings which she shared with her boyfriend James Sones, known as Jem, described as having fallen “deeply in love” with her despite her problems. The pair had a troubled relationship with James pleading with her to give up prostitution and get help for her alcoholism. 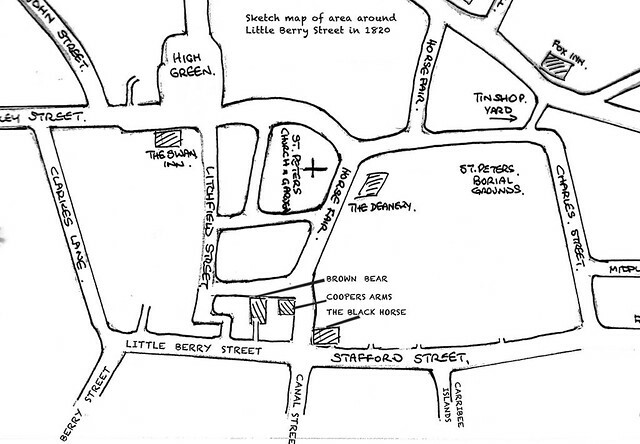 The Cooper’s Arms stood in Horsefair (Wulfruna Street), on the corner of Lichfield Passage. On the morning of June 9, 1851, Catherine and James were seen having an argument outside the “Coopers Arms” in Horsefair. Witnesses said their language was so strong, passers-by had to intervene to break it up. 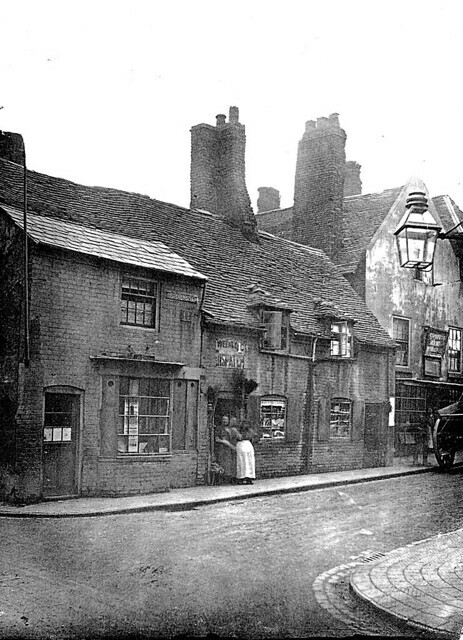 (The Coopers Arms was a busy house on the corner of Lichfield passage which prior to around 1860 besides the one into High Green was the only other carriageway out of Lichfield Street at that time, this one into Horsefair (Wulfruna Street). A few doors further on the east side of Lichfield Passage was The Brown Bear Inn, dating back to 1802, where later that day, Catherine was seen drinking with several men and steadily becoming drunk. When James went into the Brown Bear, looking for Catherine; who was a regular in the pubs in that part of town. He got very angry seeing her with other men and told her their relationship was over and wanted to collect his belongings. At this Catherine got up and the troubled pair left the pub and went through the alley that led from the back of the pub into Little Berry Street. Map showing the three pubs mentioned. 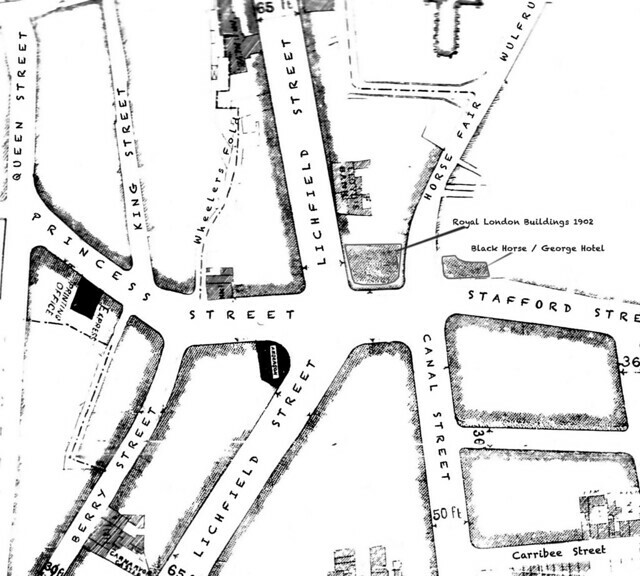 Map of the junction of Horsefair, Stafford Street, Canal Street and Little Berry Street 1875. Showing the “Vine” Inn and the “Globe” Inn at the top of Canal Street, and the Black Horse Inn at the top of Stafford Street. Witnesses said; that as the pair argued, James was seen to slash Catherine across the throat and she dropped to the ground. Passers-by rushed to help the young women, to find her throat had been cut with a wound seven inches long and an inch deep. Catherine was carried to another nearby pub, the Black Horse, across the junction of Horsefair and Stafford Street, where a doctor named James Gatis managed to stop the bleeding from her wound. Sones was heard to beg forgiveness from his lover as he was arrested, later he was taken to Stafford jail were he was committed for trial for attempted murder. Catherine died three days later from her injuries and the charges were changed to one of murder. Court records show that James Sones was found guilty of manslaughter at Stafford Crown Court on July 30th 1851, and was sentenced to transportation to Australia for life. On James Sones’s eight-month journey, among his companions were several others from the Black Country It is not known what happened to James or if he made it all the way to Australia. Borough of Wolverhampton, Scheme under The Artisans’ and Labourers’ Dwellings Improvement Act 1875. Plan showing mode of laying out of the area. In Wolverhampton, up until the passing of the Artisans Dwelling Act in 1875, powers were limited to piecemeal action, regarding the removal and rebuilding of new housing, but now with the act, the clearance of whole areas became possible. In 1877, it was agreed to pull down part of the eastern centre of town, from Queen Square to the Canal, and Stafford Street to Queen Street which included, the notorious Carribee Island area. 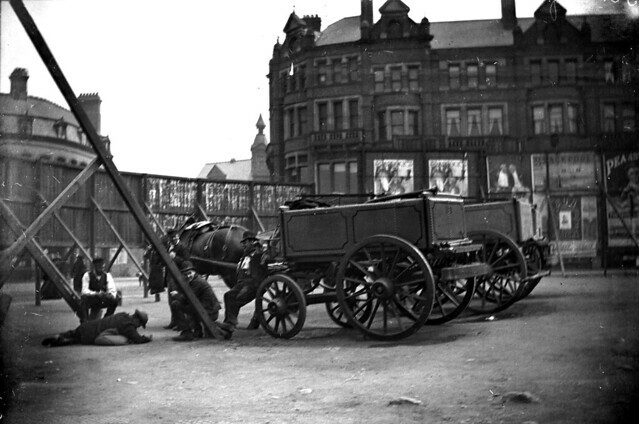 Lichfield Street at this time was only 23 feet wide and ended at Princes Square, and with no direct route to the stations, was one of the two roads was badly in need of repair. This new plan shows the new additions, the widening of the streets in question and the extension of Lichfield Street to Five Ways. In addition, you may notice the rebuilding and new street layout for Caribbee Islands. 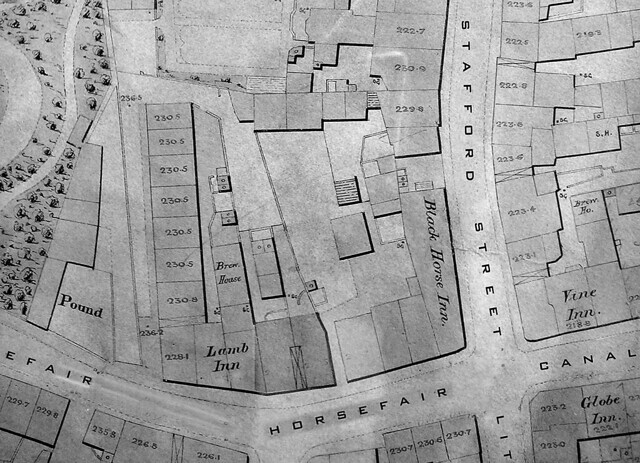 The existing Black Horse Inn and the site of the new London Buildings would subsequently be erected in 1902, the same year as Central Library. The waste ground circa 1900, almost opposite the Posada, (that was built on the site of Noah’s Ark Inn) in Lichfield Street. Above the fencing you can see on the left the roof of the “Criterion” Public House, The pointed tower on the corner of Berry Street and directly opposite on the corner of Lichfield Street is W.H. Bradleys’ Toy and fancy Emporium at 66 Princes Square. This corner of Princes’ Square the former site of the Brown Bear as well as the Coopers Arms and for the years since demolition was the short stay home for travelling shows etc.. today seen here used as parking lot for the Corporation. In 1902 The majestic Royal London Buildings that still stand today will be built on this site. Thanks are due to David Cox and Michael Pearson, who put me in touch with this episode of early life in Wolverhampton. In March of 1851 Catherine Morris had lost her child in a horrible fire, and in tragic circumstances. She was living with James Sones in Ipswich as man and wife. At the Inquest it was found that she had left her child, according to a witness, for maybe up to quarter of a hour. Further witnesses said they had heard nothing good or bad about Catherine, that Catherine was fond of the child and a good mother. Another that the parents were both fond of the child. Thank you for the information, Pedro, most appreciated, I must admit I didn’t delve into the history of the lady involved – My main aim as a Wolverhampton historian was to give an insight into the places of interest in the story published by the two gentlemen credited with writing the story.